​For painting that isn't off the wall! Restaurants and Professional Offices Are Specialties Of Ours! Pro Painters CoS is your affordable painting contractor specializing in both residential house painting and excellent commercial painting services in Colorado Springs CO. We could go on and on about 'best quality painting' and 'customer satisfaction', 'work with integrity' 'best prices around' and all of the other back patting platitudes but we assume you have read this stuff a hundred times. So we'll just say that we are honest house painters who work hard, and strive to fit all of the above descriptions. We get just as excited about covering a small room as we do about a banquet hall. No painting project is too big, or too small. When it comes to quality we are always learning about applications of the newest colors and finishes, the latest products and technologies that become available. We are happy to show you and talk about today's products when we meet with you. ​THE SOONER OUR BRUSHES CAN MAKE A DIFFERENCE. Colorado Springs painters are not an endangered species, we know there are many good painters here, that's why we will work hard to get your approval after a job well done. We also know a lot of folks will consider doing the painting themselves, but very few individuals can complete a painting project when doing it every once in a blue moon. It could be why you are reading this page. If you have been painting the wall and mistakenly smeared the stark white ceiling and screamed at the stroke of paint, you get the idea what we're yammering about. So, believe us, Pro Painters are professional house painters, we're pretty darn good at it since we have painted a ton of walls. Sure, its not rocket science, but we have a lot of practice under our belt so we mastered the art of it. Leave us pros the job to do. ​​ You'll be worry free and happy in the end knowing the place looks great, and we did it with friendly, quality paint that will last. 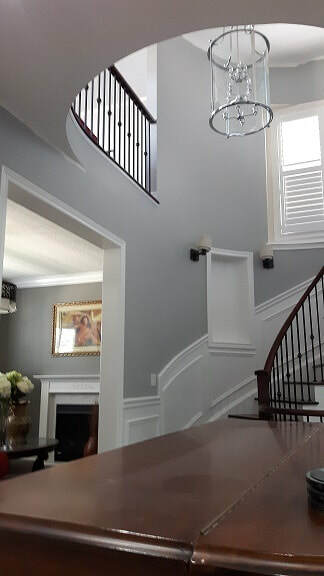 ​​First of all, as professional interior painters, we always feel privileged to be invited to someone's home and will always treat it with the utmost respect. Considerations for interior painting are: size and amount of rooms; color changes; is priming required; repairs and paint quality. We carefully considered the options and hard choices available before submitting our painting cost estimate. Don't hesitate to ask our advice on color options, paint finishes such used in different rooms and on trim such as flat, eggshell, semi-gloss finishes for smaller rooms and so on, we will be more than happy to lend an opinion. An interesting approach to certain rooms is contrasting walls. Both pictures on the right have taken the concept and created a two tone look. Imagine three of a room's walls as the prime decorating color while the focal wall may be darker finish, perhaps matching the accents. We recommend that you source interior paint ideas from decorating experts who know trends and styles that work. This can be done on line, through magazines or any source you respect. Don't forget we can help too, painting as much as we do, ideas become pretty clear. One's we can pass along. We take great care with corners, trim and edges, and we replace damaged areas. Our professional crew will repair nail pops, drywall flaws and water damage areas will be repaired and latex caulking and filling where necessary is also part of the process. Check out interior house painting for more information. ​Living in sunny Colorado, perhaps one of the most beautiful places in the world, can also bring one of the most difficult climates to maintain exterior painted surfaces. Nobody wants to paint their home every year or two, the objective is to find a way to make the appearance of your home stay fresh and last for years. The key for long-lasting, newly painted exteriors begins with the conditions, (is it raining, or too cold? etc. ), and how the paint applications will 'stick'. Preparation is the key. Before exterior paint can be applied, walls must be sanded, conditioned and cleaned thoroughly, then properly primed. Another difference in Exterior vs. Interior surfaces is the diversity of surfaces. Stucco, wood and aluminum siding, metal trim and doors; metal siding, vinyl siding and windows, drains, eaves troughs and vents. ​By the way, painting stucco is fun. ​Interior painting is year round, but when it comes to exterior paint contracting work, weather is a prime consideration. Daytime temperatures must be warm enough with no looming precipitation. We aren't meteorologists here but we can read a forecast before applying any exterior finish. Paints applied in cold weather are not likely to dry properly which will result in poor adhesion. We have been called to repaint many exterior surfaces when paint has been applied by a previous painting contractor or the DIY 'er, particularly during spring and fall months when daytime temps don't rise to acceptable levels, ideally between 50° and 90° with minimal wind. For more exterior house painting. ​Pro Painters Colorado Springs knows commercial painting and will work with you and your business to ensure complete satisfaction regarding hours of scheduling (off business hours). Restaurants can be finicky. It is an absolute must that the finished work should be immaculate, people dining out and spending money are deeply involved in their environment so splashes of paint and other faults are not acceptable. We understand the many various requirements for industrial and commercial painting projects like restaurants and we're excited to offer the same outstanding service whether residential or commercial painting is undertaken. For convenience our company considers flexible scheduling for work at night so we can reduce impact or distractions that might occur from painting contractors hanging around your place of business while you work. Every paint job is unique so we are careful to make sure we have planned properly. Our mission is to give an accurate estimate on pricing and timing as possible; and keeping that promise to complete our jobs on budget and on time. Commercial Interior Painting and exteriors is our specialty. ​D.I.Y. or Professional House Painters in Colorado Springs? ​We have talked about the DIY 'ers attempting a paint project with little or no experience or practice. Applause for the folks who want to take a shot, but cost can quickly catch up with the savings you managed, not to mention how time consuming the job can be considering the drywall repairs and water damage issues that can appear when you begin your work. However, if the urge to do your own work is too enticing, there are numerous blogs and videos on how to do-it-yourself. In fact, we have some do-it-yourself tips ourselves for your enjoyment. Make sure you get up to speed on things like nail pops, drywall cracks and holes, maybe water damage as well. ​​​Additional Special Services. Can Painters Do Dry Wall Repair? You bet we can, and do. We also finish floors, doors, some shelving and much more! If you have any ideas and are not quite sure how best to go about them, call us and request a free quote or advice. 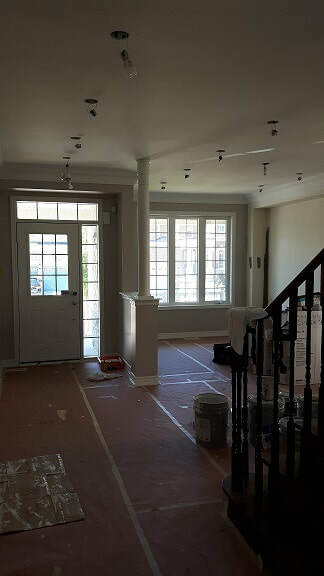 If there are any repairs that are necessary to complete a job, we can install drywall (minor repairs) as well as trim, door hardware and other pesky tasks. No need to hire another company, our professional crew is qualified for many other tasks that may come up or be required to make your project everything you imagine. If we can't do it, we'll help you find it, whatever it is. Of course we can do dry wall for our customers. Just give us a heads up when you inquire about that painting project you have been considering. ​That distinct smell you get after a fresh coat of paint can be attributed to volatile organic compounds, or VOC’s. These VOC’s, which vaporize into the air when paint is applied, are potentially harmful to both humans and our environment. These chemicals have been linked to various breathing problems, headaches, burning and watery eyes as well as nausea. Pro Painters Colorado Springs are committed to your health by offering low VOC, and VOC-free paint options. Eco-friendly paint is perfect for your next indoor project. where vaporized pollutants can get trapped in low-airflow rooms. Washed Stripes - a technique using tape and a sure hand. ​That wallpaper on the right might be from the 60's. You can see by examination that wallpaper has come a long, long way and provides an interesting decorating option for home owners and commercial establishments. See HOME WALLCOVERINGS. Safety incentive programs keep our people safe and insurance costs under control - savings that we pass on to you. Knowing about paint colors and finishes! The finish matters when choosing your color. Flat paints absorb light causing a darkening effect. Gloss paints reflect light so the colors become brighter and can appear shades lighter. You need to live with a color for a couple of days so use a few paint chips, attach them to the wall and observe the color nuances through the day. Then make your final decision on your color scheme. 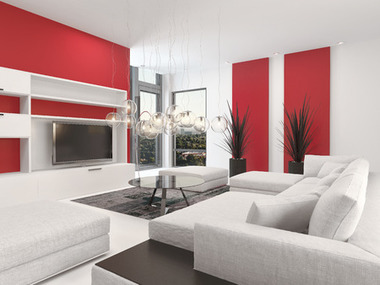 The quality of the paint can have an effect on final color and finish on your wall. Usually the less expensive paints will have some difficulty in holding that perfect color you imagined with your choice of color. Despite the incredible multitude of interior or exterior paint colors available out there, that whites and off whites remain the most selected color for interior refinishes. There are so many variations ranging from gray whites to earth tone whites. Subtle finishes can accentuate the architectural aspects of a room or simply allow decoration choices to shine through. When choosing your final colors it is imperative to consider both the finish and the quality of paint. Finishes available include flat paint, eggshell finish, satin finish, semi gloss finish, high gloss finish. The variations in same finishes from one brand to another can be noticeable so check out some different brands if you are not sure.